We have been approved by the New Mexico Construction Industries Division to offer you the CID approved Business and Law course you have been waiting for, and you can work on it At Your Pace Online. The commission has permitted the Business and Law portion to be accomplished via an online course in lieu of an exam in a physical location. If you have any questions our world class customer service representatives are here to help, don't hesitate to call us at 1-877-724-6150. Submit an application to the Construction Industries Division for your contractors license. 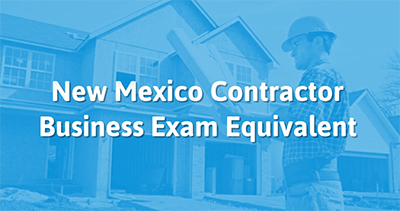 This is course can be taken in lieu of the in person Business and Law exam required by the New Mexico Construction Industries Division (CID). Simply complete this course covering laws, regulations, and business and financial management instead of taking a test. RE: Aproval of Contractor's Business and Law Course. I presented the Contractor's Business Law course submitted by At Your Pace Online, LLC to the New Mexico Construction Industries Commission (CIC) for their approval, at their scheduled September 20, 2017 meeting. The course was approved by a unanimous vote of the Commission and is officially a CIC approved Business and Law course effective that date. This course is not a Continuing Education course but a course for initial Qualifying Party certification that may be taken in lieu of the required Business and Law examination for qualifying parties, pursuant to the Construction Division. Licesning Act Section 6-13-16 C.
This course is not required to have a course number, and is an ongoing course that does not require renewal. Please be aware that changes to New Mexico statutes and rules regarding contractors will require changes to the course curriculum as necessary to ensure curriculum accuracy. Please feel free to contact me should you require any assistance.